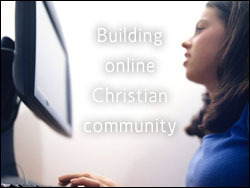 As you think about building an online community for your youth group, perhaps you should be asking what makes it distinctively “Christian.” Sure the mere fact of encouraging people and asking how they are doing is good morale, but perhaps you will find this same type of morale among non-Christians as well. As teenagers spend more and more time on the internet, how are we as youth workers going to reach them in this realm of life for them? There are four areas of focus that perhaps may be of great use in the online community as we strive to enhance “Christian” community that is already taking place in our churches. 1. Testimonies: Stories of life change and stories of being changed by God’s grace are some of the best un-tapped areas that online communities need to embrace. Often online profiles include favorite books and music but no place to include a story of life change. And granted if someone has not experienced life change and has no real testimony at this point in life, perhaps they will look at other profiles to see what this testimony thing is all about and perhaps they might even start to question where they stand with the almighty Creator. 2. Ongoing Dialog: While discussion happens at church and in small groups, the idea of discussing theology or prayer requests or culture ought to be something that Christians are in constant dialog over. As we seek to be a body of believers who not only come together once or twice a week, but are speaking and dialogging together perhaps even at midnight on the Internet about the theology behind the movie I Am Legend. 3. Involvement: Is your online group just an online group? Being on several social networks myself, I have been able to add myself to 15+ groups most of which I never look at or interact with. I simply exist within the group. Is your online community encouraging your students to sign up for things in your ministry such as small groups, praise band or the tech team? Is your online community a place for students to volunteer to go play Wii at a nursery home with the elderly? day they sign up? Perhaps students may connect online with others before even connecting in person due the walls that often come down in this relaxed environment. Brandon Riley is the Technical Director of Student Ministries at Denton Bible Church in Texas and is also the Director of User Experience for Tuggle, a social network with built-in management tools for youth ministries.